When considering plans for a bathroom remodel, most people's minds will often gravitate toward their dream shower or bathtub. While those two aspects are usually the stars of the show, your bathroom will contain a variety of other elements that must blend to create your ideal aesthetic. Not only must your bathroom features be visually appealing, but they also need to be functional, and that's especially true for your bathroom vanity. There are quite a few factors to consider to ensure that every trip into that bathroom brings satisfaction, and not regret. Once you learn how to choose a bathroom vanity, the process will be smooth and enjoyable. There are actually two products to think about when selecting a bathroom vanity - the base cabinet and the vanity top. Paired together, they create your bathroom vanity. Companies like Wolf Home Products allow you to choose both parts of your bathroom vanity individually, creating a custom bathroom vanity that is sure to please. Not all bathrooms are created equal. Bathrooms can run the gamut in a household. Are you remodeling a tiny powder room, where space is at a premium, or are you going big with your master bath? Defining who uses the bathroom, how and how often will help you define your needs for storage, vanity size, and style. Does it match your decor? A mismatched vanity can stand out among your other precisely matched decor and accessories. Our bathroom vanity cabinets and vanity top products offer many different options so you can create the ideal look for your style. How durable must it be? Depending on what kind of bathroom you're dealing with, the frequency with which you use it will likely vary. Certain materials hold long-term advantages over others, so you'll want to have a good idea of how much wear and tear it will see. Do you plan on eventually selling? If you plan on reselling your home at a future date, you'll want to equip your bathrooms with vanities that are both durable and widely appealing, so you don't alienate any potential buyers. What Kinds of Bathroom Vanities Does Wolf Offer? It can be challenging to find the right bathroom vanity, but luckily we pride ourselves on offering all-encompassing solutions for our customers. Wolf offers various vanity cabinet options in our five cabinetry lines and we carry four highly customizable vanity top options that you can choose from to meet your needs. Door Style: First, you can select the door style that best fits your bathroom theme. Does a clean Shaker-style door or a decorative full overlay door make sense for your space? Finish Options: Paint or stain? You'll have to decide whether you want a paint or stain finish on your cabinets. 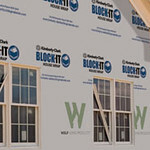 Another great option is Wolf's unique SmartShield finish that looks like paint but is strong enough to stand up to even the messiest bathrooms. Storage Solutions: Do you need extra storage in your bathroom? Each of our cabinetry lines offer unique storage solutions, such as pull-out shelves, to make even the smallest bathrooms functional. Solid Surface: Long-lasting and contemporary, this solid surface vanity material touts a nonporous surface that is moisture-, bacteria- and stain-resistant. You can even fully integrate a sink, which eliminates spaces where mold and grime can accumulate. 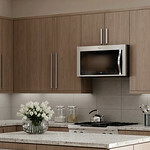 Quartz: Quartz is increasingly popular due to its ideal combination of features. It's stain- and moisture-resistant, affordable, durable and provides a sophisticated look. 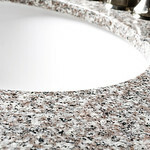 Natural Granite: Natural Granite gives every bathroom a high-end feel with its appealing sheen and unmatched toughness. Your piece will be original, too, as the color and crystalline structure vary from build to build. Cultured Marble: If you want flexibility, our special-order cultured marble option carries the most extensive range of personalization. With 45 different finishes, you can easily fit your desired look. We also offer quick-ship marble, which is a cost-efficient option for homeowners seeking simple and elegant looks. See - creating your very own Wolf Home Products bathroom vanity is easy! Choose a door style, finish, and functional amenities (i.e. number and size of drawers) and pair your favorite vanity top to create a unique bathroom vanity perfect for your home. Ready to get started? Now that you know how to choose the best bathroom vanity for your space, you can proceed with confidence. Contact a dealer in your area to see your options in-person today.